If democracy means rule by the people for the people, it has broken down. All we have today is rule by elites for national and transnational elites, marked by periodic social eruptions that fail to add up to anything transformative. The elites bounce back regrouped, the protestors are silenced or appeased, and electoral victories promising radical change end up captured by vested interests. The Arab Spring has yet to bring spring to the masses, the uprisings around the world against financial capitalism and austerity have only served to strengthen ties between banks, international financial institutions and the powerful states. The millions of people crushed by the current economic crisis and its handling by the authorities are told that their sacrifice is needed for a return to better times, while reforming governments trying to protect the less well-off rely on the approval of lenders, rating agencies, the media and powerful states. These failures of democracy are worldwide, a feature also of so-called ‘mature democracies’. People everywhere are not doing much of the governing, while those supposed to be acting on their behalf are doing nothing of the sort. The consequence is growing social misery and injustice. Left to its own momentum, this state of affairs will end in more authoritarianism or in revolutionary breakdown. A safer option would be to renew the democratic contract, clearly an aim of little interest to self-serving elites (and parochial movements) but presumably of some attraction to political forces committed to the fair and equal society. I say ‘presumably’ because it is not clear that the established wing of these forces, for example, socialist and social democratic parties and labour unions have shown much interest of late in making common cause out of embedded social injustices or in working with the insurgent movements that daily rail against the colonisations of elite power. In Europe, for example, what does the official left have to say on democracy, equality, justice, or the good society? Nothing. It is as though it accepts the fracture of the democratic contract, the reduction of politics to electoral posturing and populist appeasement, the inevitability (perhaps the thrill) of sitting at the table where elites and their ideologues gather, in hope of small crumbs of social reform. In the process it has become deadened, devoid of a vision of society beyond the status quo, detached from the subjects, trials and tribulations of everyday life, oblivious to political struggle and organisation beyond the rituals of corporatist management. Because of this deficit, the insurgencies worldwide for justice (from the occupy movement to anti-war protests and popular rebellions) have no means of amplification. Nor do the many efforts to forge a better society. 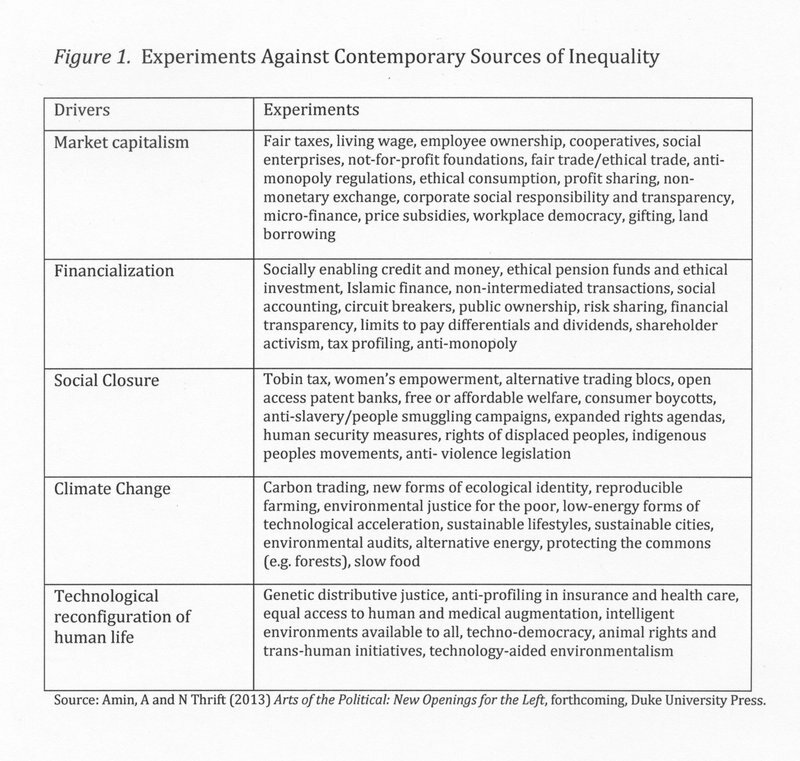 Contrary to received wisdom, there is an abundance of experiment in all parts of the world, as listed in Figure 1, attempting to mitigate contemporary sources of inequality. The normative landscape is far from homogeneous, but the experiments remain isolated, fragile, and self-referenced rather than part of a larger politics of social transformation. Today’s paradox is that there is a surfeit of grass-root activity, let down by the absence of an organised force able to gather the fragments, construct a persuasive narrative of change around them, and denude elite power in effective ways. Today, the organised left does not see the overhaul of politics and society as part of its mission. It has not always been so, for at pivotal moments in the past, altering the rules of the political has been a defining trait of the organised left. The period in Europe between 1880 and the First World War provides one such moment. Against the grain of generalised misery, oppression and political closure (just like today), a reformist and revolutionary left came into being, managing to both change hearts and minds as well as secure lasting material and institutional gains. The struggle for a society for the many and not the few took on a world making quality, made tangible by specific campaigns, from agitation for popular democracy and the rights of workers and women, to movement for the franchise, alternative lifestyles such as vegetarianism, the great outdoors and sexual liberation, and freedom from imperial rule. This quality arose out of the ability of the nascent left to project a new social order out of latent concerns, as well as develop the means to alter the grammar of politics, as two brief examples help to illustrate. The first example concerns the German Socialist Party (SPD), formed in 1875 amidst considerable doubt over the prospects of a workerist proposition in a barely industrialised and highly segmented society. This was a period characterised by disarray within a nascent industrial bourgeoisie, waning aristocratic power, lurching Bismarckian autocracy, and an acquiescent working mass scattered across the countryside and small-scale industry. Led by two towering figures, August Bebel and Karl Kautsky, the SPD quickly rose to dominate the European socialist movement, on the back of its rapid growth within Germany, boasting 1 million members and 35% of the vote in the Reichstag already by 1912. This success can be traced to the ability of a charismatic leadership and a highly organised party-union alliance to make effective cause, both within a dispersed and heterogeneous working class, and in the public and political arena. But there was more. The SPD managed to project the interests of a small and emerging urban industrial proletariat as a credible future for all. These first socialists ‘invented’, as Donald Sassoon has argued, a new political subject and a vanguard actor - the ‘working class’ and the ‘new model worker’ - out of a poor, desperate, fragmented and downtrodden working mass. This was an extraordinary political invention at a time of unimagined historical subjectivity of this sort, made tangible by the success of the SPD (and ‘free unions’) in ensuring significant practical reforms in the course of struggle (e.g. better wages and working conditions for industrial workers, welfare protections for striking members). The ability to project a proletarian future as a democracy for all also derived from the SPD’s success in clothing the movement with the ‘beauty of a thousand stars’ as the contemporary Austrian socialist leader Julius Braumthal put it, with the help of intimate publics from different social backgrounds formed around popular books like Bebel’s Women and Socialism, moving pamphlets and informative newspapers, and cultural and recreational societies playing out the good society. While the German example illustrates the power of a politics of pragmatic utopianism, the example of the British women’s movement during the 1910s illustrates the power of altering the landscape of politics itself. Its success in campaigning for the rights of women and their role in private and public life was the result of such reinvention, which forced the establishment and a patriarchal legacy into a new commons - intellectual, affective and political – in which the hegemony of vested interests was no longer protected. The struggle for recognition tore into the rules of political visibility and conduct, in the process allowing a new understanding of womanhood to be articulated in public, and with considerable fervour and organisation behind it. Three developments stand out. One is the feminist campaign after 1890 for the ‘new woman’, articulated in a wealth of popular books and magazines, which expanded a movement until then fighting for the vote for women into one also for other rights (e.g. equality within the family, the right to divorce and sexual freedom, participation in economic, public and political life). The campaign turned everyday inequalities in the lives of women into matters of public concern, along with bringing new groups of women into the cause. Another linked development is the portrayal by feminist activists of the woman as collective subject, which, as the movement for women’s rights in the workplace grew in strength, helped to connect the struggles of working and non-working women. Feminism expanded and it also joined a broader struggle for social equality and justice. The third development is the invention of disarmingly effective new political technologies, especially by Women’s Social and Political Union (WSPU) led by the Pankhursts: its military organisation, clamorous journalism, embrace of the car and steamship as symbols of emancipation, prolific use of books, banners, songs and plays, public confrontations and prison spells, and highly visible protests and disturbances. New forms of representation and agitation forced their way into political life, challenging the status quo in disarmingly effective ways. Clearly, such a selective reading of the early politics of mass emancipation is fraught with all the pitfalls of ex-post and decontextualized comparison. But a general point can be made. These formative movements proved to be influential – by design or default – because of their world-making qualities. They thoroughly changed the meaning of the political and its subjects by designing credible utopias and imaginaries of emancipation out of existing injuries and hidden interests, by building affective desire and surge with the help of new political technologies, and by converting claims into practical gains through effective organisation. They developed a world making capacity, based on the mastery of three political arts: boosting invention, leveraging organisation, and mobilising affect. It is this kind of practice and imagination that is needed today from any ‘official’ left. These arts, if anything, are intuited by insurgent movements trying to wrest new political space for a fairer society, but are lost to the official mouthpieces of the equal society. Today’s social democratic parties, unions, and the like, have no interest in making the future by refashioning the field in which latent concerns can be made public and the mainstream challenged. And because of this, the imaginative experiments of insurgent politics are failing to find traction. The organised left needs to recover its world making capacity by developing new political tactics. This is not a matter of naming the quantities and qualities of the fair and equal society – an impossible utopia, clear in its list but forever compromised by historical change and contextual specificity, and for this a source of disappointment. It is about making large quests out of existing injuries and injustices, with the help of arts of campaign that disarm elite power and manage to build counter-weight. This could involve, for example, returning to the major drivers of contemporary inequality listed in Figure 1, and building momentum around alternative forms of organisation and worth by attending to the politics of exposure, affective contagion, and fixing counter-inventions, so that a different kind of society comes into view. The official left could work at making visible equitable types of market or money and reciprocal forms of exchange, finding imaginative ways of building public interest and ethical resonance around them, along with articulating clear institutional reforms to consolidate the gains of market and financial democracy. 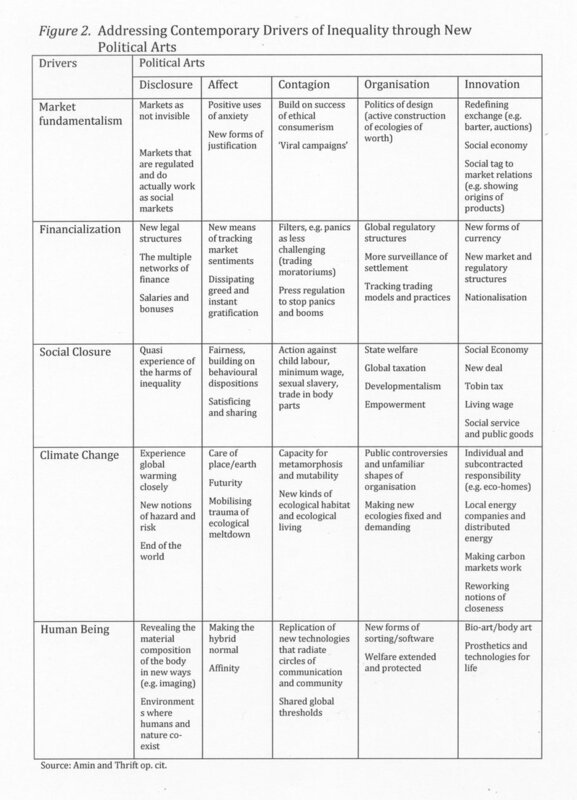 The same arts could be applied to pursue new ways of ethical and decentred human being or to build and maintain public desire for sustainable environments and ecological living, as summarised in Figure 2. Gradually, as another society begins to take shape in public and political life, the violence and rhetorical tactics of elite rule (and authoritarian insurgent movements) might become exposed and undermined, and the legitimacy of democratic rule and the fair and equal society given an airing. With sustained and imaginative support from an organised left, always in communication with democratic grass root movements, the chances of a society of and for the people (and nature) might be improved. But this, like in the past, requires active work by the organised left to fashion new collective feeling for the fair society. It has to engage in the sites where intimacies and affiliations are formed, before and beyond reason – schools, public gatherings, books, websites, blogs, broadcasts, newspapers, music venues, theatres, exhibitions. And in these sites, it has to find persuasive and diplomatic ways of working so that communal affiliations that cause harm give way to democratic and collective forms of citizenship. It has to puncture the thrall of contemporary communion in the capitalist ‘military-entertainment’ complex or its anti-secular religiosities, understand the affects formed in insurgent and grass-root communities, and above all, become clear about the kinds of social affects that make for the just society. This I do not see as a labour of indoctrination, but as the labour of creating space in the public arena for new collective feelings to circulate and amplify: work as a validating activity that holds the world in place; fairness as a gut sentiment; heterogeneity as the means by which the uncertain and turbulent future must be approached; accomplishment as an ethic of care; steadfastness to a sense of right even when the wind of fashion changes. This is a politics of apprehending the future through common feelings that frame common goals around them, bridge the gap between viral and formal politics, and rail against a politics of sameness, aversion and fear.